Finally got around to replacing my old hard gasket, amazing the difference in the old and the new. The old is flat, hard and no flexibility at all, the new can be rolled into a ball. Couldn't be easier, just snap the old one out, clean the rim, and snap the new one in. 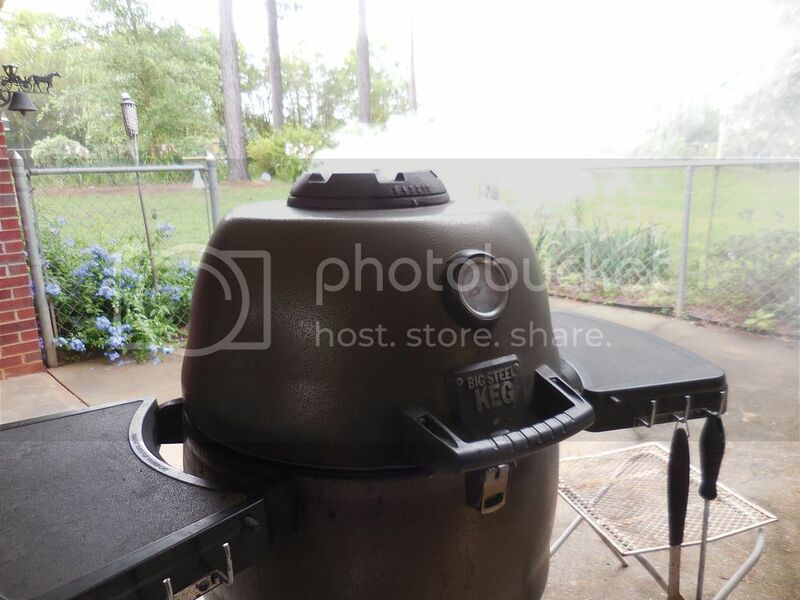 Doing ribs today, here is the white smoke billowing at startup, all coming out the top, nothing around the seal. Bob, if it's not too late.... I suggest you save a few of those clips from the old gasket in case one should pop out or break on the new gasket. Thanks Nate, not a bad idea. I soaked the old gasket in a tub of water thinking it may loosen up a bit but no luck. 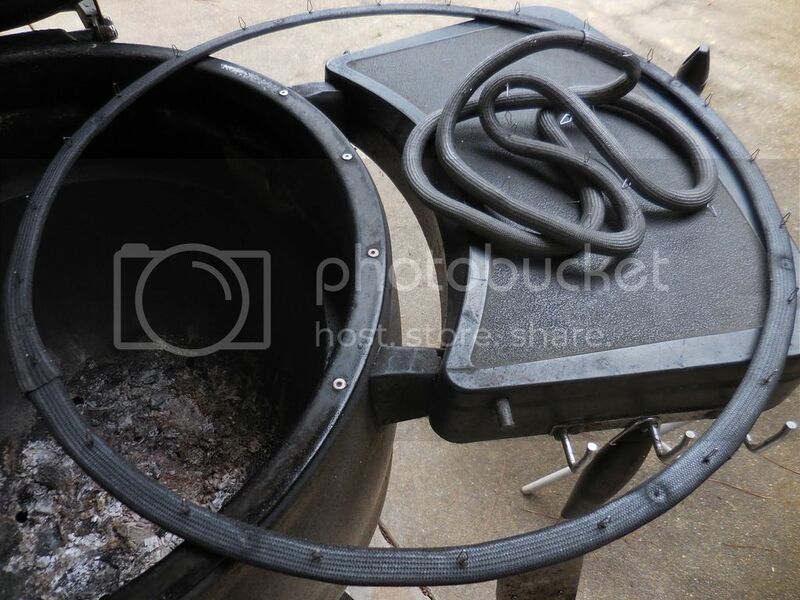 I think next time I may try the Nomex gasket on top and bottom and adjust the lid if necessary. where did you buy the new gasket? I am searching the web for it and I can't find one. Only place I know of is OMC. Just call customer service for parts. Total cost is around $42 US with shipping. I just called them. The lady told i need a 6 digit number off the keg to get the right part #. I said "i thought there were only 3 models, a 2000 - 4000 and 5000. I have the 4000". She insisted that was not enough information to give me the gasket price. So now i need to search my keg for a 6 digit model number i guess tonight. Are there more models that i am unaware of? thank you! hopefully with that info they can take my order. "Thank you for contacting Onward Manufacturing. You can order a replacement gasket by calling our customer service line at 1 800-265-2150- be sure to reference file # 1311882." any idea which number is for what? I have a spare gasket for mine, thought I would get a photo of the gasket and part number and post but it's just in a plastic bag with no part number on it. I would think all the versions of the keg use the same gasket. I ran into the same issue when I called to get a replacement top dome. I gave the numbers and mfg date off my keg and she said it was a bad number. She insisted she wanted a 6 digit number. She then told me my unit had been discontinued. Finally put me on hold and and spoke to her supervisor who apparently pointed her in the right direction. I just called OMC and they are out of stock on the gasket. They took my information and said they would email me back when they have an ETA from their supplier. Hopefully that is soon. I've got part of my gasket that pulled out and for the life of me, I can't get it back in place. In the meantime, every time I cook on it all of the charcoal burns up since I can't cut off all of the air.